4/2/19 Update – Due the record breaking snow volume at CA State SNO-Parks, OHMVR Division Headquarters has sold out of SNO-Park Day permits. Some vendors may still have inventory but please call ahead to make sure. Find a link to our SNO-Park vendors HERE. SNO-Park Day permits can be purchased online HERE but the permits MUST BE PRINTED OUT. Please plan ahead to make sure you have a great day at the SNO-Park! 4/19/19 Update – Donner Summit parking area has been cleared of snow. The Sno-park is now open. Please check back for further updates. A SNO-PARK permit is required for each vehicle parked at a SNO-PARK site from November 1 through May 30 of each year. Permits are sold as Day Permits or Seasonal Permits. Day permits are sold for $5.00 and are valid for one single day. Season permits are sold for $25.00 and are valid for the entire SNO-PARK season from November 1 through May 30. Seasonal SNO-PARK permits are available for purchase online. This online service allows visitors an easy and convenient way to purchase SNO-PARK permits. Permits may be purchased by Visa, MasterCard, American Express, Discover, or e-check. Daily permits may be purchased for $5.00; seasonal permits $25.00. An online service fee of $1.95 will be added to the price of each permit. NOTE: Oregon and Idaho SNO-PARK permits are valid in California. In addition, California SNO-PARK permits are valid in Oregon and Idaho. 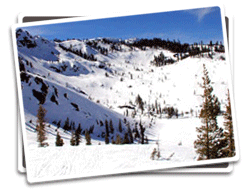 The SNO-PARK program is coordinated and administered by the OHMVR Division of California State Parks, in conjunction with the U.S. Forest Service, the California Department of Transportation, the California Highway Patrol, and various community organizations. 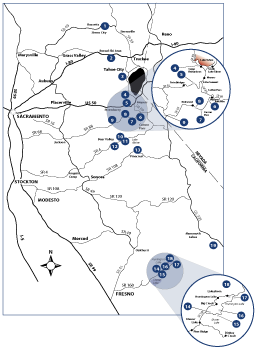 Through this collaborative effort, winter recreation opportunities are provided at 19 SNO-PARK sites along the Sierra Nevada. Distinctive brown signs located along highways identify the SNO-PARKs. Snow-cleared parking lots cannot be guaranteed on a daily basis because of weather conditions and snow plowing priorities. The SNO-PARK Program is administered by the Off-Highway Motor Vehicle Recreation (OHMVR) Division. Please call the SNO-PARKS hotline at (916) 324-1222 for more information. The SNO-PARK permit must be displayed on the left side of the vehicle dashboard where it can be seen clearly from outside the vehicle. All permits sold are non-refundable; day permits are non-transferable. Any vehicle parked at a SNO-PARK site without a permit properly displayed is subject to an $94.50 fine. Should you receive a fine and have questions, contact the court or law enforcement office of the County in which the SNO-PARK site is located. Carry a shovel and tire chains. Vehicles parked overnight need to be staked at all 4 corners with 1x2 inch by 8-foot poles to prevent accidental damage by snow removal equipment. Lock your vehicle and do not leave items of value in sight. Winter recreation activities may be hazardous. Your common sense, skill level, use of proper clothing, respect for the terrain and weather will combine to affect your safety.